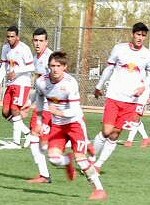 The New York Red Bulls dropped a 4-1 result to the Portland Timbers in Mobile Mini Sun Cup action at Kino Complex today. In the 18th minute, Evan Louro kept the deficit at just two stopping a clear chance in on goal for Portland's Samuel Armenteros. Portland would grab their third goal of the match in the 60th minute. Ten minutes later, U-19 Academy player Jordan Bailon crossed a ball from the left wing in front of goal causing Portland center back Vytas Andriuskevicius to knock the clearance over his own keeper's head for an own goal to make it 3-1.